On July 20, 1944, Col. Claus von Stauffenberg left a bomb in his brief­case in a con­ference room at the East Prussia head­quarters of Adolf Hitler, the Wolf’s Lair (Wolfs­schanze), before excusing him­self to take a call in the tele­phone exchange hut. In the con­ference room were Hitler and his senior officers, exa­mining opera­tions maps spread over an oaken table. It is thought that one of the parti­ci­pants, seeking leg room, moved the brief­case behind a mas­sive support almost as wide as the map table itself. When the bomb exploded, the support leg deflected the blast from its intended victim. The deto­na­tion was the start of Opera­tion Wal­kuere (Val­kyrie), the code­name of the officers’ coup. Hitler sur­vived the blast to thwart the coup and, in con­cert with Reichs­fuerher-SS Hein­rich Himm­ler’s Gestapo and poli­ti­cal courts, ex­tracted a savage revenge in the final stages of the war in Europe. Begin­ning on this date in 1944 Nazi Judge-Presi­dent Roland Freis­ler of Berlin’s People’s Court (Volks­gerichts­hof) opened a series of show trials against the con­spi­rators rounded up in the drag­net. The trials were held in the swas­tika-bedecked Great Hall of the Berlin Cham­ber Court. Selected civil ser­vants, party func­tion­aries, mili­tary officers, and jour­nalists were among the 300 or so in atten­dance. 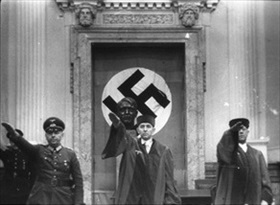 Behind Freis­ler on the dais was a film camera so that Hitler could later view the pro­ceedings. The defen­dants that day—two jurists and six army officers—were pre­vented from con­sulting with their law­yers and forced to stand before the court in shabby clothes. Freis­ler shouted down their attempts to address the court at any length and with a stri­den­cy that made it diffi­cult for the film crew to record the defen­dants’ testi­mony so that their words could be heard by a film audi­ence. All eight were con­demned to death and hanged imme­di­ately. There was no pos­si­bil­ity of appealing the ver­dict. Four more show trials of the plotters were held in August, and in every in­stance the accused was sen­tenced to death. Of the 7,000 alleged plot­ters—mili­tary and civil­ian—arrested by the Gestapo, nearly 5,000 were exe­cuted—among them two field marshals, 19 gene­rals, 26 colo­nels, two am­bas­sadors, seven diplo­mats, one cabi­net minis­ter, three secre­taries of state, as well as the head of the Reich Police. 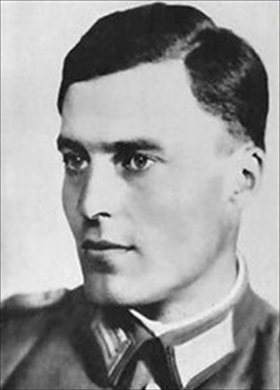 Left: Claus von Stauffenberg (1907–1944) was a colonel in the Ersatz­heer (Replace­ment Army) and the driving force behind the July 20, 1944, plot to assas­si­nate Hitler and take control of Ger­many. For his involve­ment in the failed bomb plot known as Opera­tion Val­kyrie, he and several co-con­spi­ra­tors were shot by a firing squad in the Bendler­block (head­quarters of the army) on the night of July 21, 1944, their bodies dumped in a shallow grave. 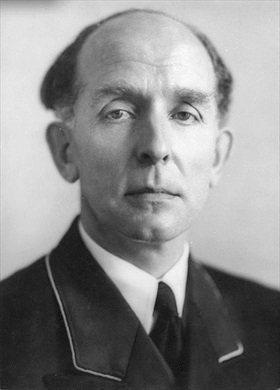 Right: Roland Freisler (1893–1945). As then-Secretary of State for the Reich Minis­try of Jus­tice, Freis­ler attended the January 1942 Wann­see Con­fer­ence out­side Berlin. Rein­hard Hey­drich, the chief of the Reich Main Secu­rity Office and head of the Ger­man secret police appara­tus, had called the par­ti­ci­pants together as part of the Nazis’ quest to find a “final solu­tion to the Jewish Question,” i.e., how to the murder Europe’s Jews. 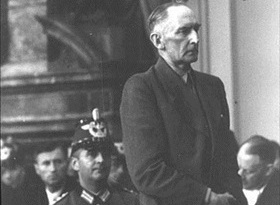 In August 1942 Freis­ler was appointed “Presi­dent of the People’s Court” in the German capital. Right: Sixty-two-year-old Field Marshal Erwin von Witz­leben, shown in this photo from August 7, 1944, was the first to stand before Freis­ler, who imme­di­ately chas­tised him for returning a fleeting Nazi salute. Witz­leben was further humil­i­ated by being forced to hold his trousers at his waist, for he had been deprived of a belt or sus­pen­ders. Next to face Freis­ler was former Col. Gen Erich Hoep­ner, com­mander of the Ersatz­heer to which Stauf­fen­berg belonged. Freisl­er addressed the defen­dant as “Schweine­hund.” When Hoep­ner corrected Freisl­er, saying he was not a Schweine­hund, Freisler asked him what zoo­logical category he fitted into.